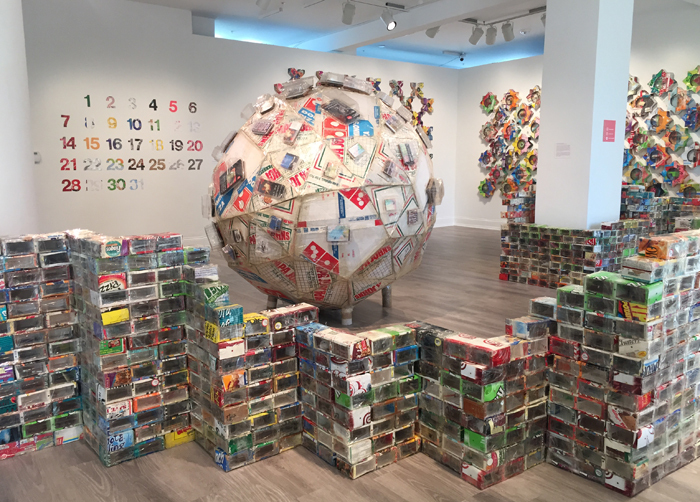 The latest exhibit at The M in St. Paul reflects on waste, consumption, and environmental responsibility. You can also make some sculptures yourself at the show during Northern Spark this weekend. Walking into David Hamlow’s exhibit at the Minnesota Museum of American Art is a bit overstimulating at first. It’s hard to know where to look. 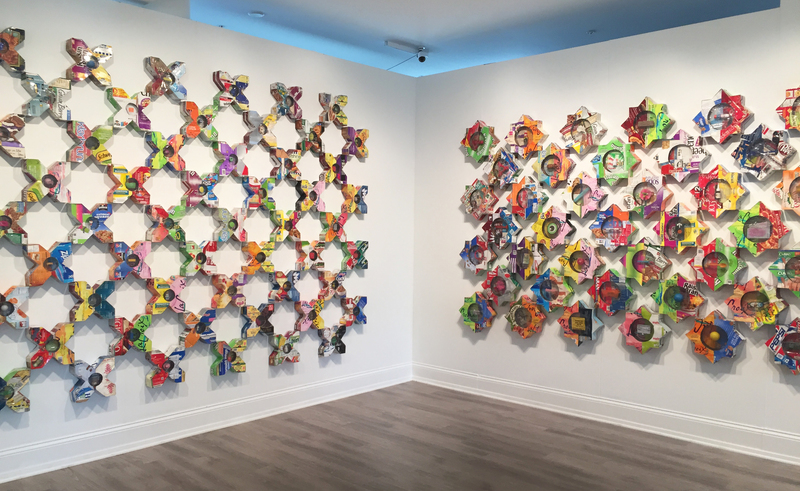 The walls and floors are littered with numbers, diagrams, grids, tessellations, and giant geodesic spheres, a room full of mathematically precise structures constructed in a hodge-podge of bright colors. Within a few seconds, though, the average American will feel—quite literally—right at home: it’s all made of food packaging. 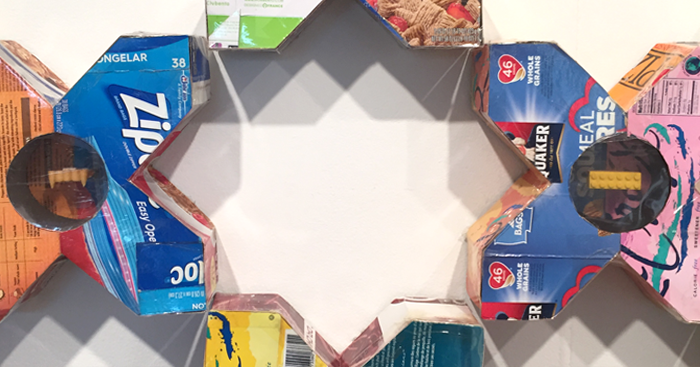 Domino’s Pizza, Ziploc Bags, LaCroix Sparkling Water, Quaker Oats, DiGiorno, Dr. Pepper, Betty Crocker, Cheez-Its… all those old familiar logos have been diced and cut and roughly taped together into these perfect, handmade geometric shapes. It’s like looking at Costco through a kaleidoscope. Hamlow’s preferred medium is trash. Specifically, his trash. 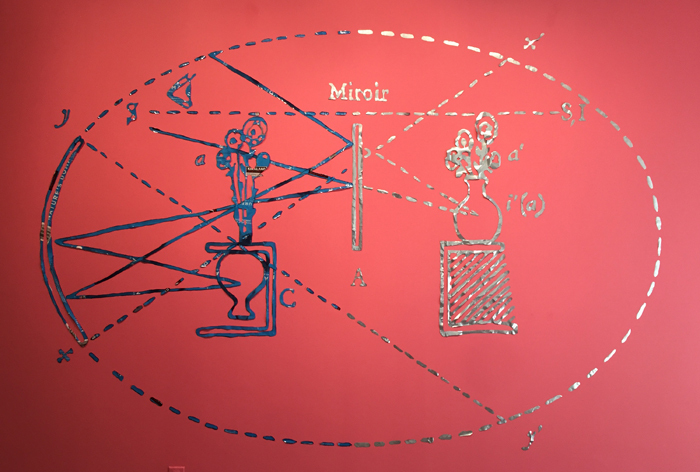 All of the work in Mirror Stage is made with either the packaging of food he and his family have consumed or with little odds and ends he has picked up off the ground during his travels—Legos, blank CDs, floss containers, eyeglasses, spray nozzles, dead batteries, Uno cards... The only exceptions are collaborations he’s made with students who brought in their own found objects. The public is invited to collaborate further during Northern Spark, in which visitors will be able to make their own sculptures with the artist himself using cardboard and various unrecyclable items collected by the M's staff and the residents of the Pioneer Endicott Building. It became clear in talking to Hamlow that trash collection is not just an artistic practice; it’s an obsession. He seems to save anything that won’t rot, no matter the size: scraps of cardboard, little pieces of plastic, rolled up balls of packing tape. Some of the pizza boxes in the show date as far back as 1998. Indeed, his years of hoarding unrecycled recyclables have recently gotten him kicked out of the storage space he was using, and now the garbage pile has moved to his house, at least until he turns it into artwork. The trouble is, I imagine, that you can’t stop eating, and the boxes must keep piling up. 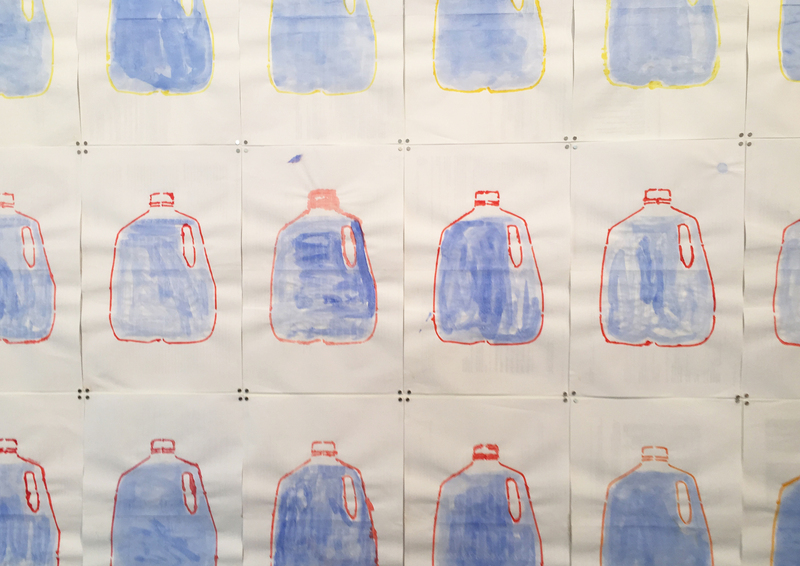 You can’t stop using water either, as his wall of blue-jugged watercolors attests. A Day of Water is a striking visual representation of the approximately 129 gallons of water his household consumes—or wastes—on a daily basis. But this exhibition is not merely a commentary on American carelessness. It touches on deep historical traditions—religious, mathematical, and philosophical—revisiting ancient ideas with modern materials. Reliquaries 8 and 9, two large wall-mounted pieces, draw inspiration from both Islam and Christianity. With crosses on the left and eight-pointed stars on the right, the two walls mirror each other with interlocking designs. One’s negative space is the other’s positive. They are based on an ancient Islamic geometric pattern that is loaded with symbology and found in ceramic tiles at least as far back as the 13th century. Each cardboard shape has a round window displaying a single found object, a reference to early and medieval Christian churches that showcased supposedly one-of-a-kind relics to pious pilgrims. It may seem a little strange to invoke the divine with a random doo-dad inside of a Wheat Thins box, for instance, but then again, maybe not. Consider the devastating impact that modernity has had (and will continue to have) on the global environment, and a proper come-to-Jesus moment may well be in order. But my guess is that the religiosity here is more of the indoor variety. This is a confession. Not to a priest or a therapist, but to the public at large. 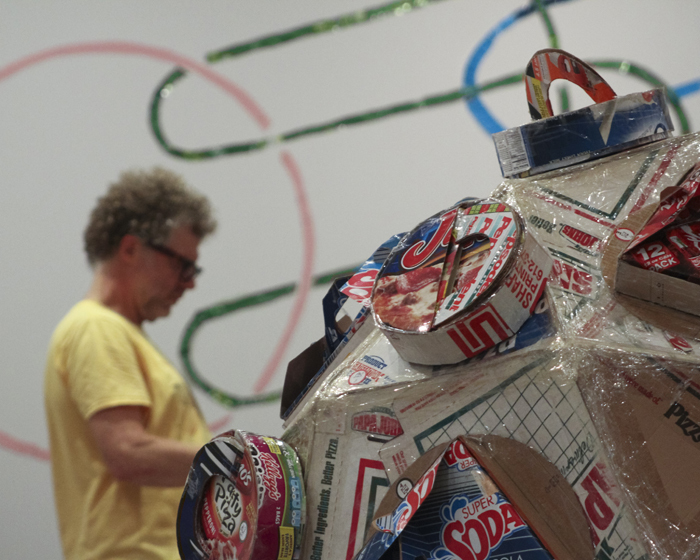 So what looked initially like a nostalgic ‘90s pizza party is actually an exercise in self-scolding, a throwing open of the bathrobe to say “Here I am, on my mountain of garbage.” The work is almost embarrassingly autobiographical, with the artist reflected here in his materials: his eating habits, his buying habits, his brand loyalties all on display. It’s interesting to note that most of the consumption referenced here is related to food, and junk food at that (at least by the standards of any reasonable nutritionist). I did not see any old magazines or cut-up clothing, for instance; no repurposed clocks or faded family photos. Hamlow’s mirror reflects what he puts into his body, what catches his eye at the grocery store, what he buys and uses and eats and discards. This trash was created by his consumption, and now it lives in this strange purgatory: none of it is headed to the landfill anytime soon, but neither will it be recycled. It is elevated to Art, but our earthly problems remain. The fun here is in seeing ourselves reflected in his refuse, noticing brands we buy or knick-knacks we recognize. But that’s sort of like going to church for the singing: we might be missing the point just a bit. We are the ones eating this crap and creating this waste, putting it out on the curb in the trash bin every week to let it be magically whisked away, out of sight and out of mind. At the back of the gallery is a large and complicated diagram made of cut-up cat food bags tacked to the wall. It’s a recreation of a drawing by French psychoanalyst Jacques Lacan, who was attempting to illustrate how we tell ourselves lies despite the truth standing right before us. This is a show about one man’s shame at living in a shameless society. The two questions that remain are whether we are willing to look in the mirror with him and, if so, whether it will do any good. Mirror Stage is on view July 30th at the Minnesota Museum of American Art. Open Hours: Thurs & Fri, 11am – 6pm; Sat & Sun, 10am – 4pm. The exhibit will also be open as part of Northern Spark on Saturday, June 10, from 9pm – 5:30am, and as part of The M After Hours on Thursday, July 6, from 6 – 9pm. On both occasions, the artist will be present to create work with the public.